India will be attempting to set not one, but three World records including two Guinness World Records, on the first ever International Yoga Day on June 21, 2015. One of the most populous nations in the world with more than 1.25 billion people, organizing an event across the country is going to be a monumental task. However, daring to see through all challenges, the Indian government under the governance of Prime Minister Narendra Modi, will try to set two Guinness World Records. The government has applied for ‘organizing the largest yoga class’ and ‘presence of people from most varied number of nationalities in a single yoga class.’ Teams from the Guinness World Records Limited are ready to monitor the events and will judge if India is successful in setting these records on International Yoga Day. Getting inspired by these attempts at records, India’s National Cadet Corps (NCC) has decided that they would set another record on International Yoga Day on June 21. They would target the record for ‘largest demonstration of yoga performed simultaneously at various venues across the entire country by a uniformed organization.’ The NCC has said that close to a million cadets will participate in this attempt at around 1,900 locations. However, there is no confirmation whether this third record attempt will be considered by Guinness along with the other two. The United Nations General Assembly declared June 21 as International Yoga Day on December 11, 2014. A budget of Rs. 300 million (approximately $4.72 million) was approved by the Indian government for this attempt on the first International Yoga Day. Bar-coded entry tickets will be used along with official auditors and the entire might of the Indian government’s official machinery, as they try to set one fresh record and attempt to surpass another. An NGO named Vivekananda Kendra, based in the southernmost tip of India, in the city of Kanyakumari, presently holds the record for organizing the largest yoga class in the world. The Indian government will attempt to break this record and set another one mentioned earlier as it tries to set two world records on the occasion of the first International Yoga Day on June 21. Jamie Clarke, Press Officer, Guinness World Records Limited, has confirmed that the Indian government has applied to them for a shot at the records. He informed that the company has received an application from the Ministry of AYUSH, Government of India for an attempt to set the records. Clarke further stated that they would attempt two Guinness World Records titles – for most nationalities in a single yoga lesson and organizing the largest yoga class. 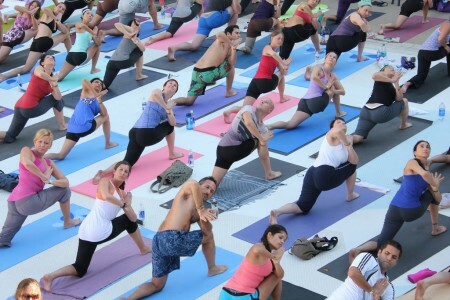 He informed that the record to beat for organizing the largest yoga class is 29,973. This record was earlier set by students from 362 schools led by Vivekananda Kendra (India), at Jiwaji University, in the Indian city of Gwalior on November 19, 2005. The students had performed Surya Namaskar, a sequence of yoga postures, continuously for 18 minutes. Clarke mentioned that there is no existing record for the presence of people from the most number of nationalities in a single yoga lesson. Guinness had set a target of people from 50 different nationalities as the minimum requirement for the record. However, sources in the Indian government and the Ministry of AYUSH have said that they would not be taking any chances and people from 100 different nations around the world have been invited. They also said that citizens from 45 countries have already confirmed their presence at the event which will be held at Rajpath, in the capital city of India, New Delhi. Guinness has laid down the entry protocols which will be followed at the event organized on International Yoga Day. The venue is a 1400 meters stretch, which the participants will enter with their bar-coded entry tickets. A consolidated attendance figure displayed by the scanner at the end of the event, will be taken as the official number of participants. As per directives of the Government of India, officials have been asked to reach the venue by 5:30 a.m. The participants would need to reach between 4:15 to 4:30 a.m. Two adjudicators for the Guinness World Records will be present at Rajpath to monitor both the attempts at the records. The Government of India has appointed its official auditor for the event, Ernst and Young (EY) that will submit a report to the authorities from Guinness. It will be a remarkable achievement if India succeeds in setting not one, but three World records, out of which two will be Guinness World Records, on the first ever International Yoga Day on June 21, 2015. 3 Responses to "International Yoga Day 2015: India Attempts Three World Records June 21"
Wonderful goods from you, man. I have have in mind your stuff previous to and you’re just extremely wonderful. I actually like what you have received right here, certainly like what you are stating and the way in which wherein you are saying it. You are making it enjoyable and you continue to take care of to keep it smart. I can’t wait to learn much more from you. That is actually a terrific web site. Spot on with this write-up, I actually think this website wants rather more consideration. I’ll most likely be once more to read far more, thanks for that info.